RULE #7: "WALK ON" means WALK OFF. It costs coaches nothing to invite hundreds of athletes to "Walk On" to their team each year, and they do! You may be a little more gifted as an athlete so you decided not to take academics seriously. That´s a big mistake. Here's a reality for you. 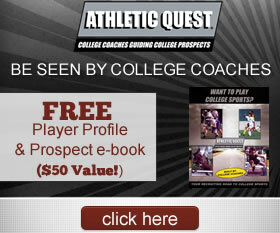 Over 500,000 student athletes every year do NOT qualify academically for NCAA and NAIA colleges. They lose college playing opportunities and scholarships simply because they did not apply themselves in school or study harder. FACT 1: Any college given the choice of two equal athletes, one with a 3.5 GPA and the other with a 2.8 GPA is going to take the better student. There are a lot of athletes equal to you out there. Don't believe it? Just think about all the national and regional tournaments, and showcases you go to. FACT 2: Did you know that you should be taking both the ACT and SAT exams? 75% of colleges take both the ACT and SAT. These standardized tests will play a huge role in your college recruiting process. In college they are called Student Athletes not Athletic Students. How to improve your focus and attention during classes. Ways to Increase your retention when doing homework. Simple steps to increase your grades by up to a full grade level! How to eliminate distractions while studying so you learn more - FASTER! Insights on how to develop consistent study habits for better results. LIMIT YOUR GPA – LIMIT YOUR RECRUITING OPPORTUNITIES! Sign up for Free Study Tips!